Mission Haritha Andhra Pradesh – Karthika Vanasamaraadhana to be celebrated on Karthika Purnima day i.e., 04.11.2017 (Saturday) as State function and Karthika Vanamahotsavam celebrations from 04.11.2017 (Saturday) to 10.11.2017 (Friday)– Certain Guidelines – Issued. PCCF (HoFF), A.P., Guntur Lr No.14058/2017/NC.2., Dated.28 -10-2017. 1. 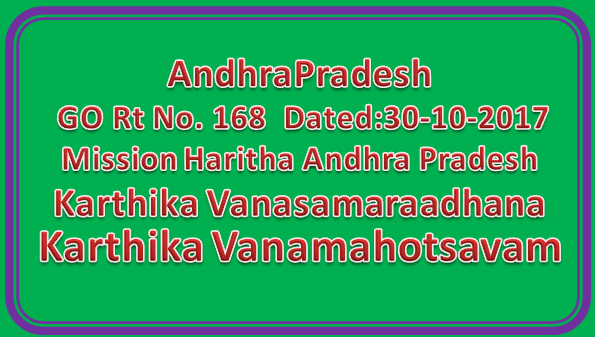 The Government of Andhra Pradesh have committed themselves to secure fifty percent (50%) of the land area of Andhra Pradesh State under green cover by 2029 through Mission Haritha Andhra Pradesh. In this direction, the government have taken up the afforestation drive under the rubric “Vanam-Manam” and have taken a number of measures to increase awareness about environment conservation and climate change adaptation amongst all citizens of the State. Further, the Government have been taking up a number of activities to strengthen the bond between people and the nature and facilitate reinforcement of people’s spiritual and physical connection with the nature, with a view to ensure sustainable conservation of the fragile eco-system. 2. Traditionally, the month of Karthika (Karthika Masam), especially starting from the full moon day (Karthika Purnima), is considered auspicious for strengthening the spiritual and physical bond with the nature. In this context, the Government hereby order that the District Administration and all departments mobilize all resources under their command to create the enabling environment essential for strengthening the bond between the people and the nature by celebrating Karthika Vana Mahotsavam for a week starting on the Karthika Purnima day i.e., 04-11-2017 (Saturday) to 10-11-2017 (Friday), by organizing nature conservation and environment promotion centric activities across the State. The Heads of all Departments with an interface with the public and the District Collectors are requested to celebrate Karthika Vanasamaraadhana on 04-11-2017 (Saturday) with the active participation of elected representatives, students, government employees, SHGs, water users associations, vana samrakshana samithis (VSSs) NGOs and people at large in a befitting manner. i. Organize week long celebration of Karthika Vanamahotsavam. This will start with Karthika Vanasamaraadhana on Karthika Purnima day i.e., 04.11.2017(Saturday) and go on till 10.11.2017(Friday). Karthika Purnima is already declared as an optional Holiday by the Government. iii. Make necessary arrangements for school children, college and university students through the Education department, with the assistance and support of the Forest department for organizing nature camps, treks, walks, runs etc., through the nature. The Rural Development and Urban Development Departments may also organize “Karthika Vanamahotsavam” in a befitting manner in all Gram Panchayats and Urban Local Bodies respectively. v. Plan and implement tree planting in the North East Monsoon areas of Nellore, Chittoor, Prakasam and parts of Kadapa and Ananthapuramu districts with emphasis on Panchavati species like Usiri, Maredu, Ravi or Marri, Vepa and Seeta Asoka in schools, colleges, government office compounds and other suitable public places with appropriate facilities for protection like tree guards etc. vi. Services of AP Green Corps (APGC), Eco Clubs, Vana Samrakshana Samithis, SHGs and Biodiversity committees may be utilized for this programme. Themes like nature conservation, bio-diversity conservation, cleanliness (Swacha Andhra Pradesh) shall be intricately woven into the entire program. 4. All District Collectors and Heads of Departments are requested to take immediate action to operationalize these guidelines.